A new Mona exhibition, opening on 5th November, explores the biology behind why we make art. On the Origin of Art is a new major exhibition that has invited four world-renowned scientists and evolutionary theorists to explore the universal human drivers behind why we make art. The exhibition focuses on a central question: is art adaptive? In other words, has art helped humans to survive and to procreate in some way? Has the tendency to make and appreciate art been handed down, generation by generation, through evolutionary time? In this exhibition, Mona’s guest curators Steven Pinker, Brian Boyd, Geoffrey Miller and Mark Changizi have each applied their scientific methodology to answer this central question. Each worked with Mona to curate a segment of the exhibition according to their individual theory. The result is four very different explorations, presented in the one exhibition made up of 230 objects from 35 countries, spanning millennia and cultures. “Both the general public and art historians tend to think of art as solely a cultural phenomenon. Whilst acknowledging the importance of this perception, Mona takes a biocultural position, proposing that, to know what art is, one has to dig deeper, past culture, to art’s evolutionary origins,” said Mona Senior Research Curator Jane Clark. The exhibition was sourced from Mona’s collection and loaned by 58 institutions from around the world, with a selection on display in Australia for the first time. Nine new commissions have been created for the exhibition. For more information about On the Origin of Art visit www.mona.net.au. As well as an incredible art collection, Mona is also home to Ultimate Winery, Moorilla. 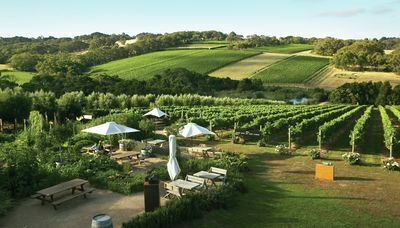 All Moorilla winery experiences incorporate some or all of Mona's facilities, such as luxury onsite accommodation at the Mona Pavilliions and exceptional fine dining at The Source, as well as admission to the museum.